Sand Dollar Beach Weddings is Your One-Stop for All-Inclusive Wedding and Reception Packages in Gulf Shores and Orange Beach Alabama. We Serve the Alabama Gulf Coast from Fort Morgan to Perdido Key, Including the Gulf State Park and Gulf State Park Beach Pavilion. 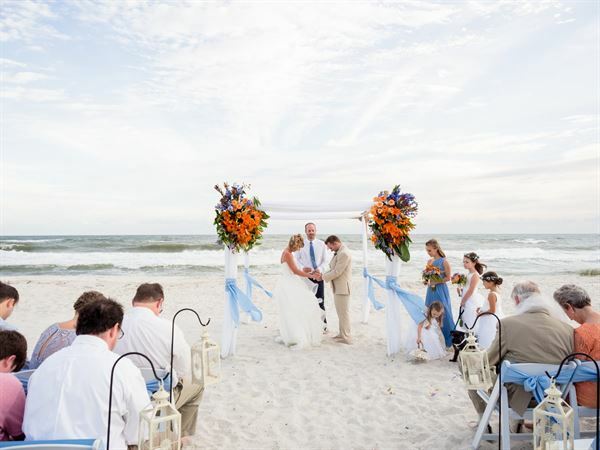 Our All-Inclusive Wedding Packages Include the Wedding Ceremony and Wedding Reception that Compare to No Other Experience on the Alabama Gulf Coast. Package Includes: • Restaurant Reception • Email and Phone Consultation • Timeline for Day of Event • Directing of Wedding Day of Event • Wedding Permit • Minister • Photography of Wedding & Reception • Bridal Bouquet • Hand Tied Roses or select flowers in season (any color) • Groom Boutonniere • Bamboo Archway with material • 30 White Resin Chairs • 30 Chair Sashes • Isle decorations with Candlelight lanterns • Wedding Cake (2 Tiers, Round, Serves 50) • Cake Stand • Delivery of Wedding Cake • Delivery Set-up and Takedown of All Chairs, Archway and Wedding Accessories • Full Service Dinner at Local Waterfront Restaurant • Choice of Reception Menu • Includes separate dining area, tables and chairs, plated or buffet dinner, chaffing dishes and sternos, service of meal, plates, flatware, white linen cloths, white linen napkins, decoration of reception tables with candles, shells, starfish etc. Decoration of food table, carving station, etc. Cutting and serving of wedding cake, plates for wedding cake.